Every dress has a history. And so does every woman. 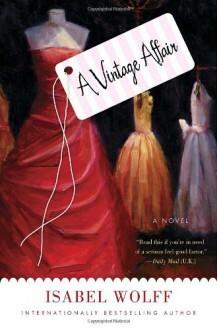 In Isabel Wolff’s captivating A Vintage Affair, a treasured child’s coat becomes a thread of hope connecting two very different women. Her friends are stunned when Phoebe Swift abruptly leaves a plum job at the prestigious Sotheby’s auction house to open her own vintage clothing shop in London—but to Phoebe, it’s the fulfillment of a dream. In the sunlight-flooded interior of Village Vintage, surrounded by Yves Saint Laurent silk scarves, Vivienne Westwood bustle skirts, cupcake dresses, and satin gowns, Phoebe hopes to make her store the hot new place to shop, even as she deals with two ardent suitors, her increasingly difficult mother, and a secret from her past that casts a shadow over her new venture.For Phoebe, each vintage garment carries its own precious history. Digging for finds in attics and wardrobes, Phoebe is rewarded whenever she finds something truly unique, for she knows that when you buy a piece of vintage clothing, you’re not just buying fabric and thread—you’re buying a piece of someone’s past. But one particular article of clothing will soon unexpectedly change her life. Thérèse Bell, an elderly Frenchwoman, has an impressive clothing collection. But among the array of smart suits and couture gowns, Phoebe finds a child’s sky-blue coat—an item with which Bell is stubbornly reluctant to part. As the two women become friends, Phoebe will learn the tale of that little blue coat. And she will discover an astonishing connection between herself and Thérèse Bell—one that will help her heal the pain of her own past and allow her to love again. An excellent read that was finished in one sitting.